Setting up a server can look like a daunting task at first, but don’t be afraid, it’s not that hard as it seems. Read the following tutorial to find out what to enter where to get you started with WhatSAB! Let me get one thing out of the way: WhatSAB is not a Usenet client, it will not connect to your Usenet account and will not download any files. What it will do is connect to the sabnzbd program (“server”) that runs on your computer and show you what that is doing at the moment. So what do you need to add a new server in WhatSAB? The address of the computer sabnzbd is running on. This can either be an IP address, a hostname or an URL like for a website. If you want to be able to connect to the server over the internet, not only your home network, you need to take some additional steps. The port sabnzbd is listening on. When the IP address is like the street and house number the port is like the name on the door bell. There may be living several persons in a house, and each has its own door bell. Just like that there are running several programs on a computer that listen for network connections, and each of that has its own port. The username and password you entered in sabnzbd for web access. Maybe the sabnzbd API key, but WhatSAB will try to figure that out automatically when you entered all the information above. First you should configure sabnbd to allow connections from other computers and devices. To do so open the sabnzbd web interface and click on Config in the top left corner. Select the General tab on the left. Here you can enter 0.0.0.0 in the Host field (or leave it empty if you are using Windows Vista). Please note that if you opened sabnzbd with http://localhost before that will not work anymore. Update your bookmark and replace localhost with 127.0.0.1. You can read more about that in the sabnzbd wiki. This depends on what operating system you are using to run sabnzbd. Windows: Open a File Explorer (on Windows 8 you may need to switch to the classic desktop first), right-click Computer in the left sidebar and select Properties. On the page that opens you should be able to find the computer name. This is your hostname and can be used in WhatSAB. Mac / Linux: Open a terminal and type hostname. Using the hostname will only allow WhatSAB to connect to your server when you are on the same network! To access it on the go please read on in “Bonus: How to connect via the internet”. The port sabnzbd is listening on can be found in the settings. In the sabnzbd web interface click on Config in the top left corner, then on General in the left sidebar. Now you should see some text fields, including one that contains the port. The port consists of numbers only and is between 1 and 65535. A single port can only be used by one program at a time, so check before you change this to something else if that port isn’t in use already. You can find more information on ports on the Wikipedia. Your username and password can be found on the same settings page as the port. It is not required that you set a username and a password, but if you open your sabnzbd to the internet I highly recommend it! You can choose yourself what your username and password should be, just remember as with every password the longer and more complicated the better. 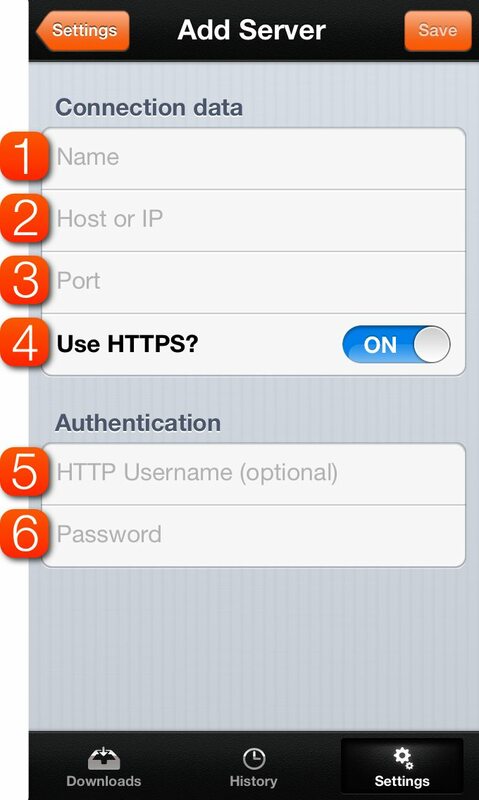 In WhatSAB you will be presented with a dialog to add a new server when you first start the app. If you already were past that dialog you can get back to it by going to Settings and tapping on New Server. Name – This is the name of the server in WhatSAB. It is only for you so that you can recognize that server later and can be whatever you want. Do you want to use https to connect to your server? You can see in the sabnzbd settings if you enabled that. The username of sabnzbd, if you configured one. The password of sabnzbd, if you configured one. After you filled out all necessary fields press the save button in the top right corner. WhatSAB will now try to connect to your server and fetch your API key. If everything goes well you can start using the app. The API key should be detected automatically by WhatSAB. If that fails it can also be found in the general settings of sabnzbd. Please read the “How to find the port section” to see how to get there. The problem with 1. is that most likely your internet provider will assign you a different IP address each time you (or your router) connects to the internet. You would need to know the new IP address every time it changes and also reconfigure WhatSAB every time that happens. A way to avoid that is to set up a dynamic DNS address. You can think of that like the address of a website (like for example whatsab.net) that points to the IP address of your home network. In your network, maybe on your router or the computer that runs sabnzbd you also run a little tool that updates this DNS record every time your internet address changes. Read more about dynamic DNS on the Wikipedia and find a list of dynamic DNS providers in the Open Directory. You may need to read the internet on how to use that in your case, but it should be possible and free in most situations. Once you have your own dynamic DNS name you can enter that instead of the hostname in WhatSAB. The second thing WhatSAB needs to connect to sabnzbd over the internet is a port number. You already found that out above? Yes and no! The port we looked up previously in this tutorial was the port that is accessible on your local network. Because you can have multiple computers on the network where each computer has a program running with that same port open someone trying to access that from the internet doesn’t know where to go. Portforwarding to the rescue! You should be able to configure your internet router to forward a public port (that can be reached from the internet) to a port on a computer in your local network. The public and internal ports don’t need to be the same, but they can be. I can’t tell you how you need to configure your router to forward the port as that is different from manufacturer to manufacturer and from router model to router model. Best look that up on Google. What I can tell you though is that you need to forward some port like for example 8080 TCP to the port you found out previously in this tutorial on the computer that runs sabnzbd. You should now be able to configure WhatSAB. I hope you found this tutorial helpful and enjoy the app!